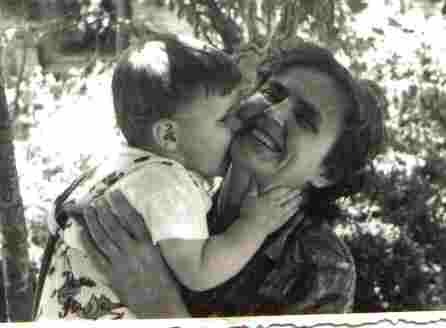 Twenty five years ago, far away in a different country on a different continent, I fought for breath, inexplicably and without any cause, without knowing that back in my home town my grandmother was dying. When the phone rang, later that night, much later that night, even without the telltale fact that my breathing had suddenly returned to normal, I knew - I KNEW. I screamed. The worst of it was that for just a moment there the blackness around me was so profound and so absolute that I could not call to mind her face, the face of that gentle woman whom I loved more than anything in the world and who would have sold her soul into eternal damnation if it would help me take just one more breath. We were special, she and I. We shared a rare and glorious love. We belonged to one another. Twenty five years ago today, exactly, they buried her. I was not there. I was still in that different country, on a different continent, far, far away. But they sent us pictures, afterwards, of that funeral. My grandmother married at 18, had her first child at 19, lost the second when that second daughter was barely two and she herself in her early twenties, had her third and final child a couple of years after that and bled out so badly, in the home delivery, that blood was dripping through the mattress of her bed and pooling on the floor below. They took everything out, after, and there were no more children - until my mom, that oldest daughter, produced me. And to me, she gave everything that she had left. She had a limited education, as was not uncommon for girls in her era, but was fiercely intelligent for all that and read a lot and knew everything that was going on around her. She never worked for a day outside her home. But come the day of her funeral, CROWDS turned out to say goobye to her. Everyone who had brushed her life even just in passing, they all knew what she was, what we had all lost. I wept when I saw those throngs, standing quiet and respectful a few paces behind her casket at the service, before it was taken away for cremation. I wept because I knew why they were there. We would not see her like again. She was seventy three years old. It now seems... so young. She's been my guardian angel, a part of my soul, ever since. Her picture sits on my bedside table and from it she smiles at me, watches over me. The picture is signed to me on the back, in her careful schoolgirlish handwriting. It is something she gave me, she touched, she once held. I wear the worn gold band that was once her wedding ring on my own finger. I miss her, still, every day - every day of these past twenty five years, this quarter of a century that now separates our shared past from my today. I miss the softness of her voice, the warmth in her eyes, the sound of her laughter. She left me a lifetime ago.